In our last tip we explored when to use tags, custom fields, and notes. This week we are going to show how to create mutually exclusive tags. This can be very handy when a customer should only be allowed to have one of a group of tags. For example, you may gather demographic information such as gender, marital status, or age group. If you don’t need to merge these fields into an email then you can save a custom field by using tags. For gender, your options might be Male and Female. 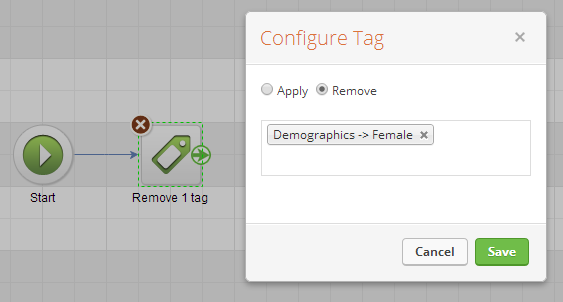 If a customer is tagged with Male, you want to make sure they aren’t also tagged with Female. If they are tagged with Female, you want to make sure they aren’t tagged with Male. To accomplish this, you can configure a campaign to keep the tags mutually exclusive. Create a new campaign. For each tag in your group of mutually exclusive tags, create an Other goal. Configure the goal to be achieved when the tag is applied. Next, add a Sequence for each goal, and connect the goals to the sequence. Edit the sequences. Add a Process→Apply/Remove Tag item. Configure it to remove all the tags except the tag that was applied in the goal. For example, the sequence for the Tag applied: Male goal should remove the Female tag. The only thing left to do is to publish your campaign. Once it is published, Infusionsoft will automatically keep your tags mutually exclusive as they are added to contacts.